LOOKING FOR A MULTI-PURPOSE LOW LINT WIPER? TRY THE LARGE INDUSTRO WIPES! It can be challenging to find a wiper that provides a versatile yet comprehensive solution when it comes to low lint industrial cleaning. Either the product is not fit for heavy duty use or suffers from poor quality issues. 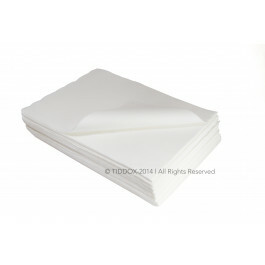 The TIDDOX LOW LINT INDUSTRO WIPES have been designed and manufactured in response to these challenges as an industrial grade quality product that provides an ideal solution for low lint wiping tasks. What makes the INDUSTRO WIPES stand out? Super Strong: A tough polyester fiber component makes the wipes tear resistant and durable for multiple wipes, even with the application of strong chemicals or solvents. Highly Absorbent: Any fluid coming into contact with these absorbent wipes gets soaked up instantly. The magic is performed by the high wood pulp material component which absorbs any liquid rapidly. Smooth and Non-Abrasive: Soft textured cleaning cloths do not harm even the most delicate surface. Ideal for low lint equipment cleaning tasks or window and glass polishing. Low Lint Cloth: The dense construction and low particle count means minimal lint or loose fibers released during wiping. MANUFACTURING & ENGINEERING: Factories and production lines use these low linting industrial cloths to clean equipment and machinery, and to wipe-off grease and grime effectively. AUTOMOTIVE and CAR CARE: Garages, panel beaters, auto body shops and vehicle detailing companies use these cloths to remove the most stubborn dirt and oil from engines, hubcaps and vehicles bodies. The large surface area and low lint feature makes them very popular with car care professionals to polish windscreens, glass, and the interiors and exteriors of vehicles. HOSPITALITY: Hotels, restaurants, cafes, bars, lounges rely on these low lint hospitality wipes to take care of any spills, as well as to clean and polish glass, metal and wood surfaces, appliances and even lobby items. Also useful in commercial kitchens for grease and oil absorption tasks. HEALTHCARE: Ideal for the varied requirements of children and seniors in care can be met using these healthcare wipes, including equipment cleaning, wiping counters, removing stains, etc....the applications are endless. MEDICAL: The strict hygienic environments in hospitals, clinics and vet practices are maintained using these low lint medical cloths which are safe, super absorbent and fit for medical purposes, including tattoo parlours! PRINTING: Used as a low lint cleaning material for cleaning certain printing equipment and accessories. Also very absorbent of inks and solvents. PAINTERS: Because of the low lint qualities of this wiper, it is often favoured over rags by painters looking for a low lint cleaning cloth during painting preparation, application and cleanup. Varied uses include touchups, wiping off paint, safely wiping canvases, cleaning paint brushes, absorbing solvents and paints, and wiping down surfaces. So in industries where a professional wiping product is required for low lint wiping tasks, don't compromise with inferior products, and choose INDUSTRO WIPES which are specifically designed as a large versatile low lint industrial wiping fabric, manufactured to the highest standards and suited for any industry application requiring an non-abrasive, absorbent, low lint cloth.